I was born in Barcelona. After my graduation in Product Design (Elisava, Barcelona) I started my studies as Ceramist (Massana, Barcelona and Escola de Ceràmica de la Bisbal, Girona). In 2007 I set up my first studio as a partnership in Barcelona. Then, we moved the studio to Mexico where I prepared my own clays and glazes as well as improved my gas firing techniques. In 2013 I set up my own studio in the UK mainly throwing vases on the potter’s wheel with special interest in large format pieces and in the investigation of glazes. Porcelain fired at 1300ºC is the body that I use. Its strength, finish, fluidity and whiteness are the most important reasons why I employ it as well as its connotations of quality. Porcelain is like a white canvas ready to apply the glaze I would like to. It is a very tough material and I must show respect as well as domain and control while working with it. I am very interested in the Oriental Glazes in general but more specifically in the “Oil Spot” type of glazes searching for new finishes and colours. The “Oil Spot Glazes” are very challenging and extraordinary beautiful. 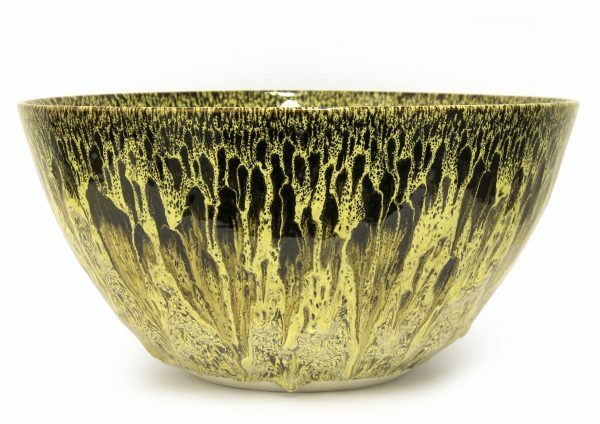 They are a type of “Tenmoku” glaze originally from China during the Song Dynasty (960-1279). “Yuteki” or “Oil Spot”, is an effect that occurs when there is an overload of iron oxide which is allowed to heat up slowly and forms effulgent spots on the surface.